The Cumberland & Dumfriesshire Farmers Mart P.L.C. held their had forward 1,573 head at their weekly sale of ewes, shearlings and hogg with lambs at foot at Longtown on Tuesday 25th May 2010. Again a good show, all classes met an exceptional demand. Top price of £87 for Greyface hoggs with singles from Yewtree. Hoggs with singles:- Greyface £87, £84, £77 Yewtree, £77.50, £75.50 Briggle, £77 Mossband Hall, £70 High Nook; Texel £73 Duke Street; Blue Texel £70 Kinkry Hill. Hoggs with twins:- Greyface £60 Mossband Hall, £53 Prospect. Shearlings with twins:- Greyface £59.50 Bayles. Ewes with singles:- Cheviot Mule £61.50 High Chesters; Texel £60 Flex; Greyface £53 Flex; Hill Cheviot £45.50 East Middle, £43 High Craigton; Blackface £35.50 Over Cassock. Ewes with twins:- Greyface £62 Drumcork; Texel £56.50 West Mill Hills; North Country Cheviot £54.50 West Mill Hills; Hill Cheviot £43 High Craigton, £40 Georgefield. 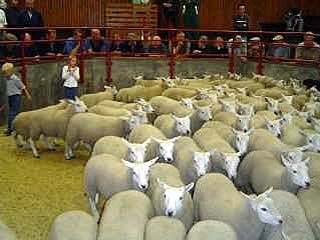 Geld hoggs:- Dutch Texel £130, £120 Alderley Terrace; Greyface £89 Kinkry Hill. Store hoggs:- £58.20 Linton House, £55.50 Muirhead, £53.50 Edges Green. Cast Ewes:- £76.50 Linton House.